Larch trees in Mongolia’s Altansumber forest. Millions of small-scale farmers will be better equipped to withstand the negative impacts of climate change while at the same time improving livelihoods, thanks to a new global push by the United Nations agriculture agency announced during World Forest Week. 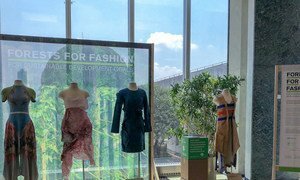 On Friday, the Food and Agriculture Agency (FAO) and partners launched the second stage of a successful international partnership that supports forest and farm producer organizations across Africa, Asia and Latin America during the gathering, known as COFO 24. The Forest and Farm Facility initiative, or FFF, began in 2013 as a way to help rural women’s groups, local communities and indigenous peoples’ institutions, among others, bolstering their technical and business capacities to fight climate change and improve food security. The initiative’s second phase is now being rolled out over the next five years across 25 countries in Asia, Latin America and Africa, from the original pilot group of ten. "These groups make up a large proportion of the rural poor and rely on farming, forests and agro-forestry systems to grow food and make a living. Rendering their lands resilient to climate change is key to their livelihoods and identity,” said Daniel Gustafson, FAO's Deputy Director-General for Programmes. The initiative scales up the effort to help forest and farm producers develop climate resilient landscapes, strengthen enterprises and generate work opportunities for women and youth, and encourage better policies to help the rural poor, according to FAO. Some 1.5 billion forest and farm producers make up 90 per cent of the world's farmers, which provide about 80 per cent of Asia and sub-Saharan Africa's food supplies. That adds up to 500 million family farms and 30 percent of forests in the global south. The FFF’s second phase will provide financial and technical support to strengthen organizations which represent forest and farm producers. It will also increase access to markets, finance and training – with a focus on vulnerable groups, such as women and youth. So that forest and farm producers can better manage their land to withstand climate impacts, FFF will roll out adaptation and climate resilience activities as well. "Forest and farm producers are more powerful when organized,” stressed Mr. Gustafson. “By building their capacity, the Forest and Farm Facility initiative will help more producers and their organizations withstand the effects of climate change, create opportunities for their most vulnerable members, access benefits, and influence policies to better address their needs," he concluded.